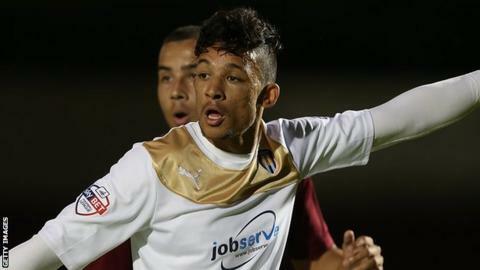 Macauley Bonne scored his first goal in 11 games but Colchester were held to a draw by 10-man Chesterfield. Spireites midfielder Gary Liddle was sent off after only 16 minutes for a foul on Kane Vincent-Young. Chesterfield kept the U's out until Drew Wright broke free with 20 minutes remaining, cutting the ball back for Bonne to strike right-footed. However, three minutes later Lee Novak converted from the spot after he was felled by Richard Brindley. Colchester's winless run in League One stretched to 17 matches as they remain rooted to the foot of the table while a point was enough to take Chesterfield out of the relegation places. Match ends, Colchester United 1, Chesterfield 1. Second Half ends, Colchester United 1, Chesterfield 1. Attempt missed. Kane Vincent-Young (Colchester United) right footed shot from outside the box misses to the left. Attempt saved. Owen Garvan (Colchester United) right footed shot from outside the box is saved in the top centre of the goal. Attempt saved. George Moncur (Colchester United) right footed shot from the centre of the box is saved in the centre of the goal. Substitution, Colchester United. Gavin Massey replaces Joe Edwards. Corner, Chesterfield. Conceded by Tom Eastman. Attempt missed. Macauley Bonne (Colchester United) header from the centre of the box is too high. Corner, Colchester United. Conceded by Sam Hird. Corner, Colchester United. Conceded by Drew Talbot. Substitution, Chesterfield. Chris Herd replaces Connor Dimaio. Oliver Banks (Chesterfield) is shown the yellow card. Oliver Banks (Chesterfield) wins a free kick on the right wing. Lee Novak (Chesterfield) wins a free kick on the right wing. Joe Edwards (Colchester United) is shown the yellow card for a bad foul. Attempt saved. Sylvan Ebanks-Blake (Chesterfield) right footed shot from the left side of the box is saved in the bottom left corner. Attempt blocked. Oliver Banks (Chesterfield) right footed shot from the right side of the box is blocked. Goal! Colchester United 1, Chesterfield 1. Lee Novak (Chesterfield) converts the penalty with a right footed shot to the bottom right corner. Penalty conceded by Richard Brindley (Colchester United) after a foul in the penalty area. Penalty Chesterfield. Oliver Banks draws a foul in the penalty area. Chris Porter (Colchester United) wins a free kick in the defensive half. Foul by Tom Anderson (Chesterfield). Goal! Colchester United 1, Chesterfield 0. Macauley Bonne (Colchester United) right footed shot from the centre of the box to the bottom right corner. Assisted by Drey Wright. Foul by George Elokobi (Colchester United). Attempt saved. George Moncur (Colchester United) right footed shot from outside the box is saved in the centre of the goal. Substitution, Colchester United. Drey Wright replaces Darren Ambrose. Substitution, Colchester United. George Moncur replaces Elliot Lee.